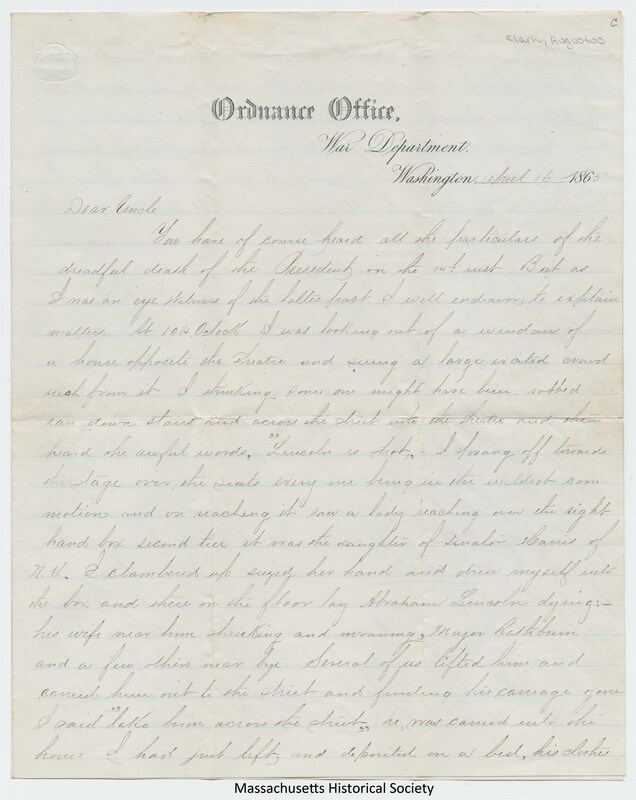 This letter, written by Augustus Clark, a War Department employee, to his uncle, Stephen M. Allen of Woburn, Massachusetts, includes a firsthand account of the awful scenes at Ford's Theatre in Washington, D.C. after John Wilkes Booth had shot Abraham Lincoln. Clark also describes what he witnessed at Petersen's boardinghouse across the street from the theatre, where Lincoln died. and his pulse fluctuated from 105 to 42 in about three hours. fainted twice before his wound was dressed and he got home. man that ever was President and a friend of the south. for you as a relic.